Original Print. Composed by Johann Sebastian Bach (1685-1750). This edition: Urtext. Piano (Solo). Score. 76 pages. 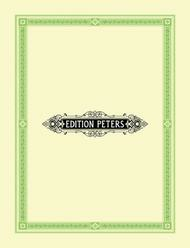 Edition Peters #EP8586B. Published by Edition Peters (PE.EP8586B). This edition is based on the first printed edition of 1751, rather than the early autograph score dating from the early 1740s (for which please see EP8586A).